New year, new skin! 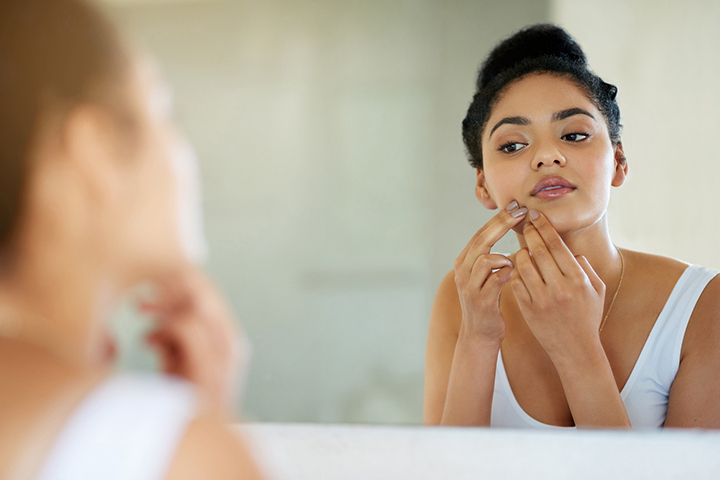 Whether you’re looking to try a new approach to treating your acne, looking for some new tips to improve your daily skincare regimen, or wondering if a facial is right for you, some expert advice can be the first step in a new direction. Join Sally Wohlegemuth, Aesthetician within the NorthShore MedSpa, for a chat all about skincare. She’ll take questions and provide her perspective on common skin conditions, the procedures and products used to treat them and how aestheticians and their services can help you achieve your skincare goals. Hello! I'm Sally Wohlgemuth a Licensed Aesthetician and part of the team here at the NorthShore Medspa. I'm ready to answer any skincare questions you may have. Our skincare chat with Aesthetician Sally Wohlegemuth is now open. You can submit questions at any time during this chat. Note that due to a high volume of questions, we may not be able to answer everything today, but will provide additional expertise at a later date. How can I increase collagen for a fuller, healthier-looking face without fillers or invasive procedures? A wonderful way to increase the collagen in your face is to induce it with a controlled injury. Here at the MedSpa, there are a few ways we can do that. Microneedling, Pixel laser or as a gradual increase, a chemical peel. Once the collagen is stimulated, it takes about three months to see the final result. I used a hair removal cream to remove ingrown hair from my chin. I had to discontinue it because it gave me bumps and discoloration around my chin. How can I get rid of this? It looks as if you caused post-inflammatory hyperpigmentation. The best way to diminish the pigment is to use a tyronase inhibitor. A hydroquinone will help to supress your melanocyte and pull up the pigmentation. I just started noticing very small, but superficial red veins on one cheek. Can I apply a topical cream/medication to help these disappear? We do have a topical here at the MedSpa (Rosaclear from Obagi). However; the quickest way to diminish your broken capillaries or reduce your redness is with an IPL (Intense Pulsed Light) treatment. How do I know if microdermabrasion is right for me? The safest way to know is to come in for a skin consultation. There are a number of factors that determine if you are a candidate. Contraindications include rosacea, broken capillaries, active acne, sun-damaged skin and skin that is not intact. What anti-aging services can an Aesthetician provide? Here at the MedSpa, we have several options for anti-aging skin dependent on whether or not the patient is in need of preventative or corrective options. We can recommend skincare products, provide non-evasive treatments such as facials, peels and microderm. We also perform laser, IPL, pixel and microneedling treatments. All can be geared toward anti-aging. How often do you recommend getting facials when you are on a budget? I'm a firm believer in at-home care. Although, it is ideal for a patient to have a treatment every four to six weeks, what you are using on a daily basis is far more important in achieving your skincare goals. A customized skincare regimen will keep your skin happy and healthy. What's the difference between pixel and microneedling, in terms of benefits? Microneeding and pixel are both controlled injuries. Microneeding does have far less downtime at about two-three days, which is ideal for someone who does not have downtime available. The pixel laser at seven-ten days downtime. The main difference in treatment is the collagen induction. The pixel is not only hitting the dermis, but also heating the tissue at an optimal level. This procedure stimulates far more collagen. What skincare products are the most important? SPF cream, moisturizer, toner, serum? By far the most important product you can have is a physical SPF. Physical meaning it should contain a zinc oxide or titanium dioxide. When using one of these mineral based sunscreens, you are physically protecting your skin. The sun rays are literally bouncing off your skin and are not absorbed like when you are using a chemical sunscreen. Being outside in very cold weather, how you can protect your skin? It is true that you can wear sunscreen in winter? You absolutely should be using an SPF in winter. The sun is still damaging and being absorbed. My favorite way of protecting my skin in the winter is also by keeping it hydrated by incorporating a hyaluronic acid into my regimen. You can also bring a humidifier into your bedroom at night. You will notice a huge improvement in your skin. I am 43 and have been dealing with rosacea for 2 years. I use store brand facial products recommend by a plastic surgeon who has performed laser treatments on my face. I began limiting my dairy and meat consumption since January. Are there any additional suggestions you can think of to manage it? Rosacea is one of my favorite skin ailments to treat. It is also one of the most trickiest. Because rosacea is hereditary, it is something that you will always have to treat. IPL laser can improve the redness tremendously. We also have topicals here at the office specifically for rosacea. How do I combat wrinkling and crow's feet around my eyes? Also, clouded pores on my nose and chin? Are facials something I should have in my regular routine? Don't underestimate a good eye cream. We have several here to treat different skin types. Depending on the severity, Botox might also be a fantastic option. As for the "clouded" pores, I'm assuming you mean blackheads. Yes, a facial and some at-home care should help you to diminish them. What can I do about excessive dryness of the skin around my eyes? If you are suffering from excessive dryness around the eye area, incorporating an eye serum with a hyaluronic acid before your eye cream should help tremenously. We will take a few more questions. I've had lot of problems with acne and open pores since my early 20’s. I tried everything you can think of from over-the-counter to going to my doctors, and nothing is working. What else could I possibly try? Sounds like you are in need of adding a benzoyl peroxide into your regimen. Benzoyl peroxide targets the bacteria in your pores that cause acne, specifically whiteheads. Start with a low dose to acclimate your skin. However; without a proper analysis of the skin, it is hard to determine. I would recommend you come in for a consultation to discuss. Is there a basic skincare routine that you recommend for daily use? I just use a cleanser, moisturizer and eye cream, but see all these videos nowadays with routines that seem to have 5 or 6 products! So confusing! The most important thing about your regimen is that it is tailored specifically to your skin. You are on the right track with your regimen. I'd definitely add a physical SPF for protection as well. It is the best thing you can do for your skin! This will be the end of our chat - thank you for your questions. As noted, we will work on additional content to address unanswered questions. For more information about skincare or to set up your own appointment with Sally, contact the NorthShore MedSpa. Thank you to everyone who submitted. I hope I answered all of your skincare questions. Please feel free to give me a call at the MedSpa at 847.504.2300 with any follow up questions. If you were unable to participate in the chat and had any other skincare questions, please email me at medspa@northshore.org. I will kindly respond. Schedule an Appointment at the MedSpa! To schedule an appointment at the NorthShore MedSpa, call 847.504.2300 or request a consultation online. Sally talks more about how aestheticians can help patients improve their skincare. Struggling with acne? Read our acne chat for some insight from one of our dermatologists.